Dewpider in game: 1,078 Who? Important notice! Pokemon Dewpider is a fictional character of humans. Dewpider (Japanese: ???? Shizukumo) is a dual-type Water/Bug Pokémon introduced in Generation VII. It evolves into Araquanid starting at level 22. 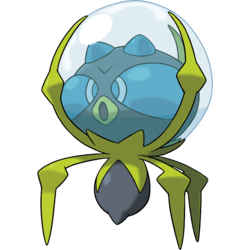 Dewpider is a Pokémon resembling a spider. 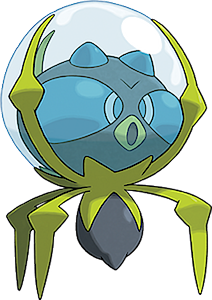 The most prominent feature of Dewpider is the water bubble that covers its head, which is anchored to the thorax by the means of three thin, green projections. The bubble serves as a means of protection to Dewpider's soft head and allows it to breathe when on land. When this Pokémon comes across enemies or potential prey, it slams its bubble-covered head into them. Dewpider has a large, gray face with large blue oval-shaped eyes. It has two small blue spikes on its forehead and a yellow mouth. Dewpider's body is primarily light green with three thin, green legs, and a gray abdomen with a small stinger on the bottom. Moves marked with a superscript game abbreviation can only be bred onto Dewpider in that game. Dewpider may be based on the diving bell spider, a spider that lives primarily under water, gathering air into a bubble around its abdomen to breathe and provide air supply to its nest.